Winter won't stand a chance with this Active Fleece D-Ring Striped Dog Coat by Dogo in Gray! 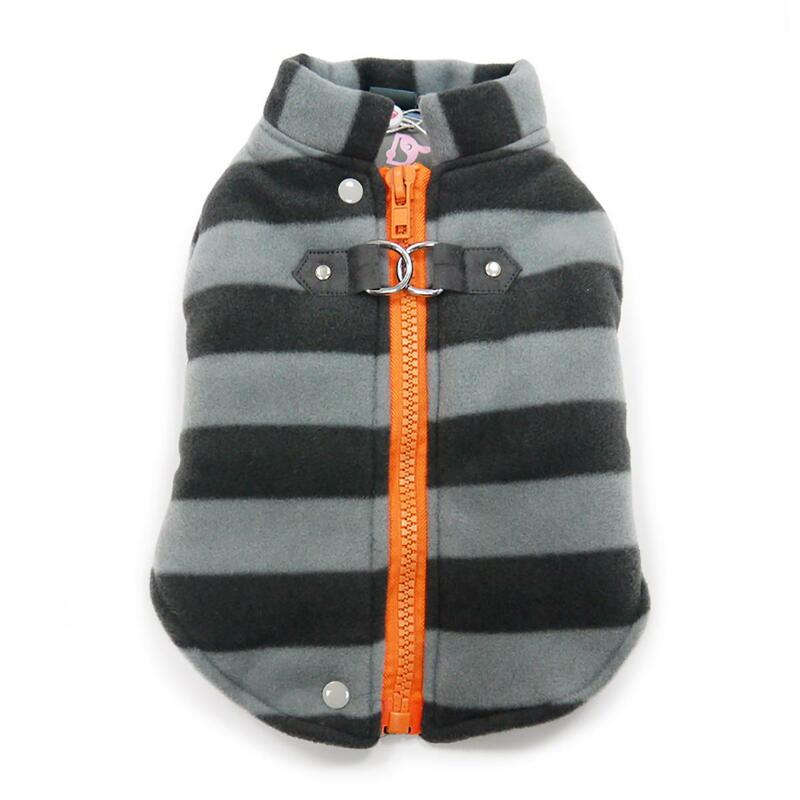 The Active Fleece D-Ring Striped Dog Coat by Dogo is a great way to keep your little one warm when heading out into the cold. 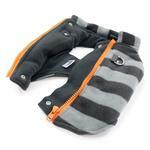 Designer striped design with contrasting zipper closure on back. 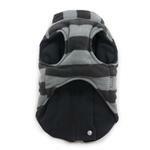 Full chest coverage with a fleece lined interior. Double d-ring leash attachment for a secure walk. X-Small: Chest 10.5-13" Neck 7.5-9.5" Length 7.5-10"
Small: Chest 12.5-16" Neck 9-11" Length 9.5-12"
Medium: Chest 15.5-18" Neck 10.5-12.5" Length 11.5-14"
Large: Chest 17.5-20.5" Neck 12-14" Length 13.5-16.5"
X-Large: Chest 20-23" Neck 13.5-15.5" Length 15.5-18.5"
Active Fleece D-Ring Striped Dog Coat by Dogo - Gray Customer Photos - Send us your photo! 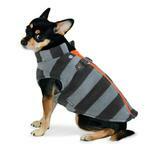 Rocky loves his warm Dogo fleece coat. He thinks the orange zipper is super cool. He says it's easy to put on and fits great. He likes using his orange leash from BaxterBoo also. He thinks it makes a statement. Posted On 03/06/17 by Jenn D from Sherwood Park, Yes, Jenn D recommends this product! Love the fact this has a D ring. My little guy looks so adorable in this. Great quality. Thank you! Posted On 01/25/17 by d c from Seattle, WA Yes, d c recommends this product! This is so cute on my little 7-8 lb. ChiChi rescue put it straight on him when it arrived. 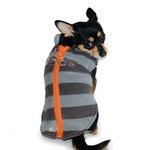 It was easy to put on him (sometimes he doesn't like putting his legs into clothes) I got the small & it's perfect he's long & skinny but got a 15" chest & I love it on him too - it will keep him cozy as he shakes in the winter as very little fur on him! Looks really well on my dogs!